Al and Barbara Kyte are long-term native plant gardeners. 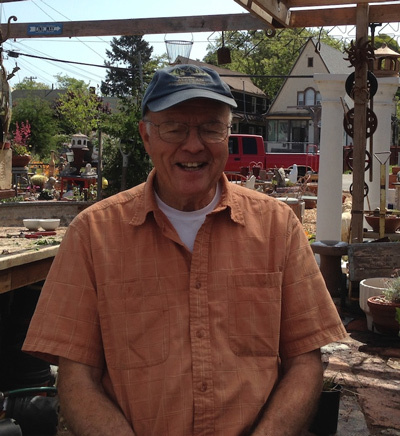 CNPS Horticulture Director Susan Krzywicki met Al recently at Pete Veilleux’s East Bay Wilds Nursery and was delighted to hear that he was so involved in this garden tour as well. She shared photos from Al’s garden on an earlier blog post, so you can see his own accomplishments. In my nine years as “garden host”on the Bringing Back The Natives tour, I consider this year’s tour as most closely approaching the “ideal”tour experience I have seen yet. The seventy-degree temperature and beautiful guitar background music set a mellow, pleasant tone for the day. Everyone–family, friends, volunteers, and strangers–seemed to respond in positive, enthusiastic ways.If I count children and people I let walk through our yard after hours, I had 500 visitors for the first time. That’s not bad for a place like Moraga, that is well off the beaten path. I always enjoy introducing people to the native plants I have come to love as well as to share the knowledge I have. But what really makes it all worthwhile is seeing peoples’responses when the beauty of a garden blows right past their expectations. Repeat garden visitors have come to expect changes in our garden and are often able to recognize and appreciate the work I have done this year. First-time visitors, on the other hand, are more likely to appreciate the accumulated effect of what I have been putting together over the previous 40 years. Having received this positive feedback, I am encouraged to start looking anew at how radically I can alter the landscape at my disposal to create an even more attractive habitat for next year’s tour. Too many people still need to realize that a California native plant garden can offer wonderful, year-around beauty as well as to restore lost habitat in ways that conserve water. ← Landscape Architect poll says natives are hot!